What makes "killer" bees so deadly? When bees attacked a Texas couple over the weekend, it seemed like a scene out of a horror film, according to the way one of the victims described the scene to the Associated Press. More than 30,000 bees swarmed the couple as they exercised their small horses. At first, the woman and one of the horses jumped into the pool to avoid the stings. There were so many bees that the sky turned dark, as if it was night, she said. The couple eventually escaped into the safety of their house, covered in bee stings, but the horses suffered a fate much worse. The first horse died before help arrived; the second died several hours later despite the efforts of an equestrian veterinarian. Five hens also died in the attack. 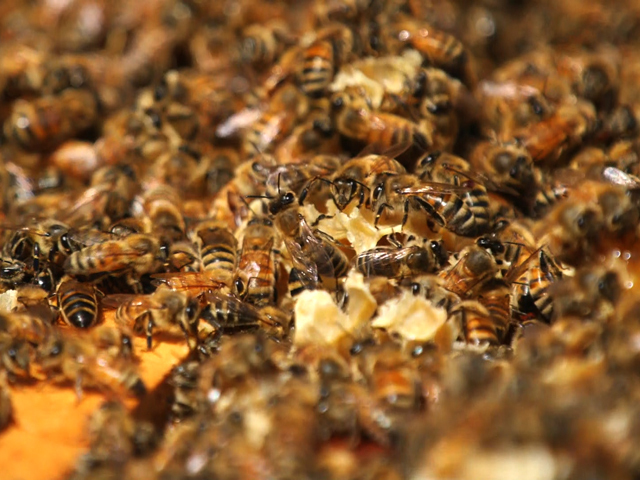 According to the AP, the bees are being tested to see if they are Africanized or "killer" bees. The ordeal comes just weeks after a 62-year-old Texas man died when he was attacked by 40,000 bees. In March, two Tampa Bay public park employees survived after being attacked by about 100,000 bees. According to experts at the University of Illinois' Department of Entomology, there are about 40 fatal bee attacks each year. The reason Africanized bee attacks are more deadly, explains Dr. May Berenbaum, a professor at the school, has more to do with the sheer number of stings than the actual bee venom. With killer bees, "the venom is not more toxic," she explained to CBSNews.com. Rather, when killer bees are disturbed, "they are more likely to pursue the source of disturbance more consistently." "Bee venom is a cocktail of biologically active components that are designed to inflict pain. The honey bee stings only defensively -- they don't try to kill, they try to educate," Berenbaum said. The pain is meant to warn predators -- in this case, the humans that disturbed the hive. The venom also sends a signal to fellow bees, marking the predator. This accounts for the repeated stings. Killer bee attacks are so much more aggressive because when a killer bee hive is disturbed, the entire colony attacks. By comparison, when a European honey bee hive is disturbed, only about 10 percent of the bees will attack. "If you can't escape that's when the fatalities occur," said Berenbaum. Killer bees are a mixed breed of African and European honey bees. They made their way to the U.S. in 1990, traveling north from Brazil, where they were first introduced in 1957. The attacks started growing in frequency around 2011, when fatal attacks were reported in Arizona and Texas, as well as aggressive attacks in California and Florida. Berenbaum says this has to do with expanding populations, rather than a biological change in the bees. "One limit on the spread of Africanized bees is cold temperatures, they can't over winter," she said. "If winters are getting milder, there are more places that they'll persist." Additionally, as the killer bees spread to new territory, they are encountering people who are not accustomed to dealing with them. "Honey bees have been in the U.S. since the 17th century, so people have had a long time to get used to them," she said. Any time a new species moves into an area, though, there is "always a learning curve" and people are still learning to steer clear of killer bees.